Scooper - Technology News: What does the future hold for commodity exporters? What does the future hold for commodity exporters? There is no doubt that China’s ongoing growth slowdown has had far-reaching effects on the global economy. But its role in the sharp fall in commodity prices that has occurred since 2014 – an outcome that has been devastating for commodity-exporting countries, including once-dynamic emerging economies – is more limited than the conventional wisdom suggests. In fact, China’s slowdown is only a part of the commodity-price story. To be sure, there is a clear correlation between Chinese GDP growth and commodity prices. In the early 2000s, when Chinese growth accelerated, commodity prices rose sharply; since China’s slowdown began in 2011, energy prices have fallen by 70%, metals prices by 50%, and agricultural commodity prices by 35%. But the view that China’s slowdown is the main driver of the collapse in commodity prices is incomplete, at best. As new research by the Asian Development Bank shows, while China plays a significant role in commodity markets – accounting for about half of global consumption of metals, coal, and pork, for example – it is not nearly as dominant as is widely believed. China accounts for less than one-fifth of world consumption of sugar, wheat, poultry, and beef; 12% of world consumption of crude oil; and 5% of natural gas. And, in fact, some of the commodities that have experienced the largest price declines – most notably, oil (down 73%) and natural gas (down 55%) – are those in which China is a relatively minor player. 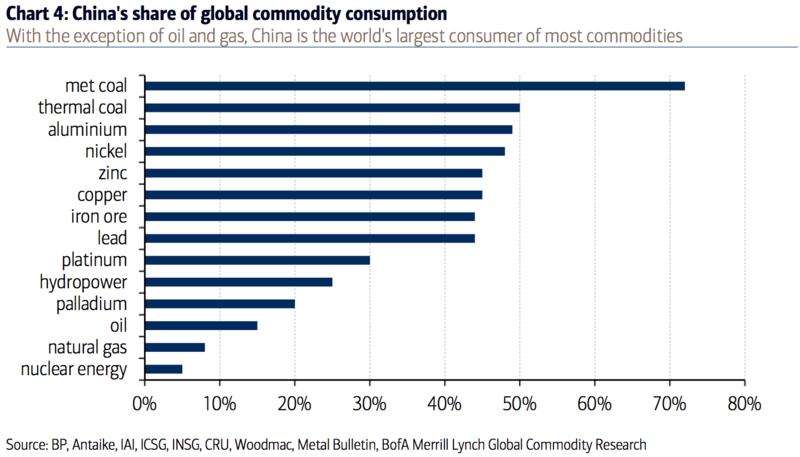 Moreover, China’s actual commodity consumption is even lower than the figures suggest. Conventional measures, instead of taking into account cross-border production chains, simply take the sum of a country’s production and net commodity imports to determine its level of consumption. But, for China, a sizeable proportion of the commodities it “consumes” is actually used in the production of goods that will be exported to the rest of the world. Indeed, almost one-third of Chinese metals demand is used to satisfy export demand. Subtracting the commodities embedded in China’s exported manufactured goods would substantially reduce China’s apparent role in these markets. A look at the commodity-price fluctuations themselves reinforces this view. Consider copper: From 2001 to 2006, prices gyrated wildly, with price declines of 30% in some years and increases of 150% in others – all while growth in Chinese industrial production and demand for copper remained relatively steady, at 15% and 20%, respectively. Clearly, other factors – ranging from supply-side factors and global demand to speculative demand and inventory adjustment – are also playing a major role in driving outcomes in commodity markets. So what does China’s continuing slowdown imply for commodity prices? Even though China’s growth has moderated since 2011, the country’s commodity-consumption growth still outpaces that of the rest of the world. As a result, its share in global commodity consumption has been rising. This should not be surprising, given that Chinese GDP growth, though down significantly from its double-digit heyday, remains above 6%. While the shift from an investment-led to a consumption-driven growth model will weaken growth in demand for metals and energy, it will also bring an increase in demand for food products and services, and hence for agricultural commodities. The conclusion is clear: China’s changing economic situation does not spell disaster for commodity exporters. On the contrary, even if, as many fear, China’s economic growth slows further, its impact on commodity prices will be limited. Bolstering prospects for commodity prices further is the promise that demand in other emerging giants, such as India and Indonesia, will accelerate in the coming years. The rest of developing Asia’s economy is currently about 4% larger than China’s, and twice as large as China was in 2000, when growth in the country’s commodity demand began to accelerate. If solid growth in Asia’s other emerging economies continues over the next decade and a half, it will generate commodity demand at least as large as China’s in the boom years. The drag on commodity prices from China’s growth moderation is real. But the sharp and generalized drop seen in commodity prices should not be laid entirely at China’s feet. Perhaps more important, with the country still importing large volumes of commodities and the rest of developing Asia set to generate a new surge in commodity demand, the prospects for a commodity-price rebound look brighter.